While it’s certainly important to present a professional front to your potential new hires, it’s also to your benefit to put them at ease as well. The more comfortable a given person feels during the interview process, the more likely you’ll be to see the real him or her and get a proper picture of who the candidate really is. Greet interviewees with a warm smile and a friendly introduction. Also, make sure you’re in a position to be 100 percent attentive throughout the time slot scheduled for the interview. Limit interruptions like phone calls and other potential distractions. 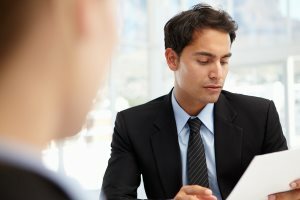 One of the best and most effective ways to evaluate a given candidate is to make sure that most of the questions you ask are open-ended. There are some tried and true classics that are seen as such for a reason. For instance, the ever popular: “Tell me about yourself?” Also the standby: “What makes you interested in working for our company?” These questions and others like them are popular with interviewers for a reason. They allow candidates to convey information in a way that also tells you something about who they are and how they see themselves – important information for you to use in determining how a person might fit in with your company culture. An extremely important part of a job interview is the section of time at the end usually reserved for questions the interviewee may have for the interviewer. Not only is this the time where you get to present yourself and your company in the best possible light to job seekers, but it’s also a valuable opportunity to continue to evaluate candidates. You can tell quite a lot by a given person by the questions he or she asks, including whether or not the person is likely to be a hard worker, what he or she is looking for out of a work experience, how much of a team player the person is, and so forth. Giving candidates the opportunity to ask questions will also show you his or her motives. Why did the person really apply for this job? If during the question portion of the interview he or she only asks about salary and benefits, this may give you an inclination of why the candidate really wants the position. On the other hand, if the person asks about company culture, the role, his/her potential future team members and managers, this too could show you that the candidate has the right motivation for seeking a position with your company. Be sure to close the interview by thanking the interviewee for their time and being clear in regards to any follow-up instructions you may have for them. While you should avoid making any promises you won’t be able to keep – such as assuring the candidate of a specific date by which a decision will be made – do be clear about how you intend to follow up with him or her in order to let you know your final decision. Follow up in a timely manner as well, especially if you’re seriously considering the candidate for hire.